Alex and Tracie search for juvenile Echinacea plants in experiments qGen2 & qGen3. In 2017, we found 1006 three-year-old plants out of the 2526 original seedlings found in 2014 (we found 1724 plants in 2016) in the qGen2 cohort. In the qGen3 cohort we found 248 of the 644 seedlings. 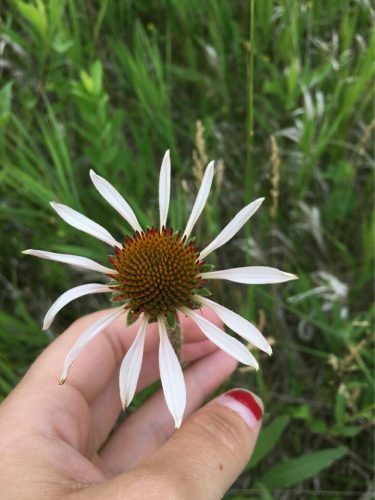 The main goal of the qGen2 and qGen3 experiments is to quantify the evolutionary potential of two remnant prairie populations of Echinacea angustifolia by estimating the additive genetic variance of fitness. We make estimates for two mating scenarios. The first scenario is an experimental crossing design with all matings among plants from two “core” sites: SPP and LF (core x core). The second design uses sires (pollen donors) from the core and dams from sites peripheral to the core. The crosses performed (core x core, core x periphery) in this experiment will quantify additive genetic variance for fitness in each site and each experimental group. Additionally, we will test for differentiation among families; do progeny from sires differ after accounting for maternal (dam) effects? Location: The sires (pollen donors) are in the remnants Landfill and Staffanson. The dams (seed plants) are in exPt 1 and they originate from remnants. Specifically, the grand-dams (seed plants of dams) are from remnants Landfill (core) & around Landfill (peripheral) and remnants Staffanson (core) & railroad crossing sites (peripheral). All progeny are in exPt 8. Data collected: We used handheld computers to collect data on juvenile plants. You can find more information about Heritability of fitness–qGen2 & qGen3 and links to previous flog posts regarding this experiment at the background page for the experiment. 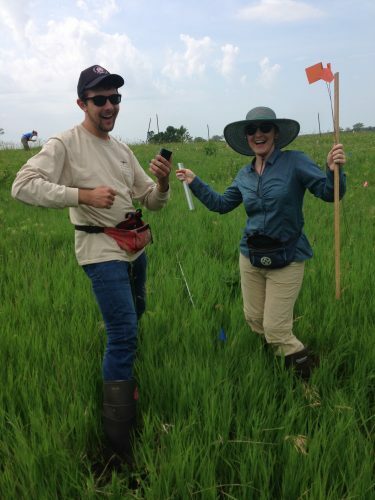 Alex and Lea measure qGen3 seedlings with much enthusiasm. In 2016, we found 1724 two year old plants out of the 2581 locations where plants had previously been found for the qGen2 cohort and 644 seedlings in the qGen3 cohort. Our crossing success, measured by the proportion of full achenes to total achenes crossed, increased in qGen3 (31%) compared to qGen2 (24%). 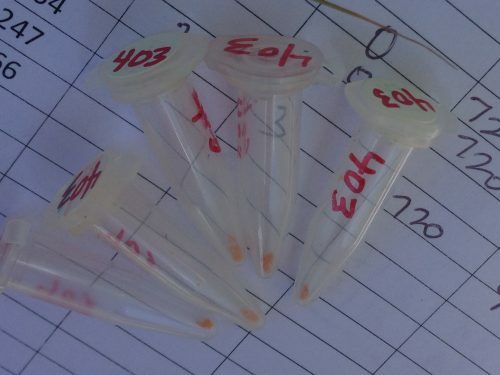 While we planted approximately the same number of full achenes in the qGen2 & qGen3 cohorts, the germination rate was 4 times greater in qGen2 (41%) compared to qGen3 (10%). This difference was likely due to differences in environmental conditions. The Spring of 2016, was quite dry and probably tough on Echinacea seeds and sprouts. Data collected: We used handheld computers to collect data on seedlings and juvenile plants. Today was another great day on Team Echinacea. This morning we continued our work on Q2, and we continued to make significant progress. We measured many plants and found at least five new plants in the experimental site. After a hearty lunch and a short time marveling at ice formations in a water bottle, Amy Dykstra gave a presentation on her research, which included her study of local adaptation of Echinacea. The afternoon was filled with preparations for IS projects (for the Wooster folks) and independent projects for the rest of us. Leah and Laura quickly became adept at catching pollinators, but were not so successful at transferring the collected pollen to fuchsin jelly. 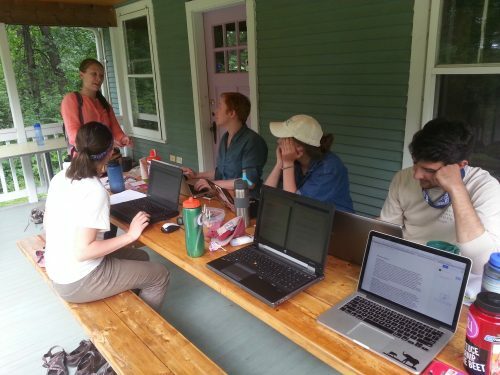 The rest of us hunkered down on our computers, read some literature, prepared project proposals and thought about how hard it would be to use NMR and IR to analyze pollen. Leah regales us with stories of captured pollinators and attempts at melting fuchsin jelly on a car dashboard. The exciting news of the day is that we found our first flowering Echinacea in P1 and at Elk Lake Road East! Tomorrow we will find out how many more Echinacea are flowering. 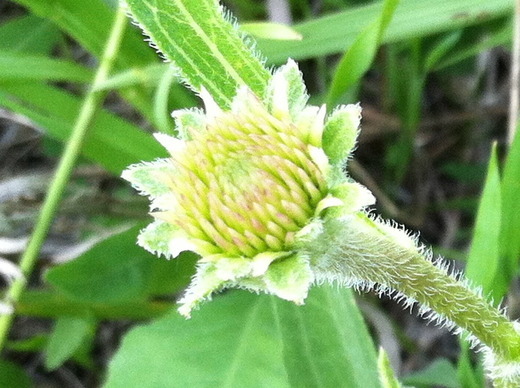 The second flowering Echinacea (found at Elk Lake Road East)! 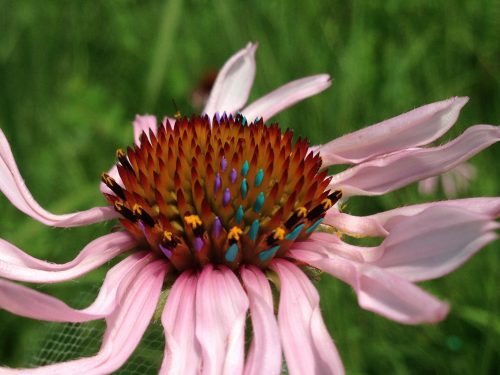 The goal of the qGen2 and qGen3 experiments is to compare the evolutionary potential of two remnant prairie populations of Echinacea angustifolia by estimating the additive genetic variance of fitness under two mating scenarios: crosses performed within the core sites (core x core) and crosses performed between the core site and nearby sites (core x periphery). Additionally, we will test for differentiation among families; do progeny from sires differ after accounting for maternal (dam) effects? 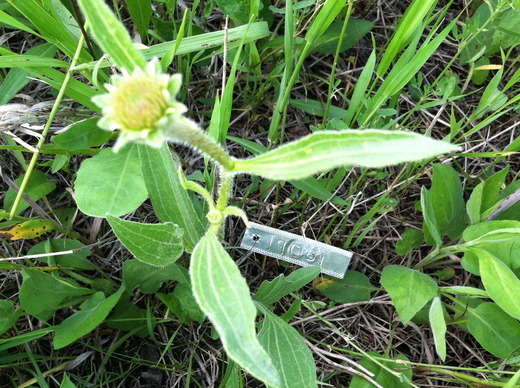 In June 2015 we assessed survival and measured 1-year-old plants from qGen2. During the summer and fall of 2015 we replicated the qGen2 experiment through a second crossing experiment. We sowed the resulting achenes in exPt 8 as our qGen3 cohort. Read more about the qgen2 and qgen3 experiments. 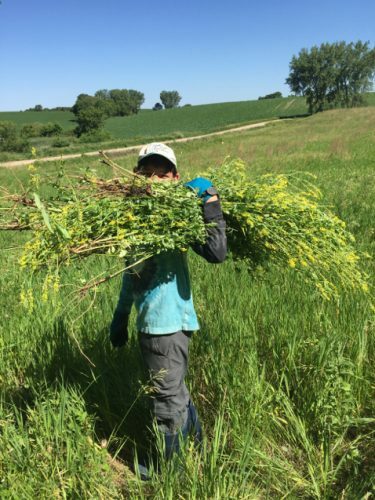 The summer field season is off to a great start! 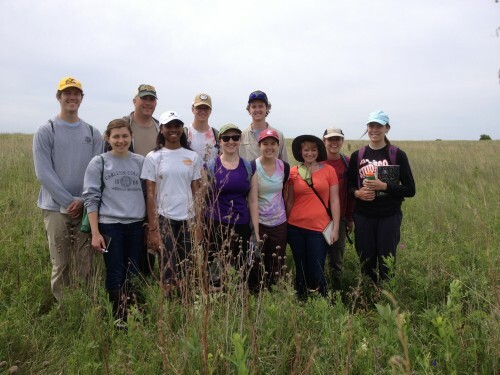 We have assembled an excellent team to investigate ecology and evolution in fragmented prairie habitat focusing on the narrow-leaved purple coneflower as a model organism. Meet members of the team. We started the season with tours of local prairies large and small, including Staffanson Prairie Preserve, Hegg Lake WMA, which are large and protected. 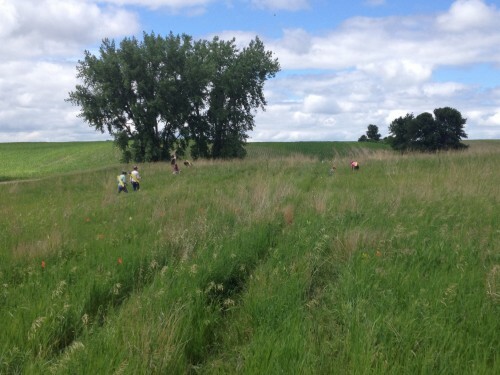 Stay tuned for team-members’ first impressions of some of the nearby remnant Echinacea populations. Team-members hail from near & far: Barrett, Elbow Lake, and Alexandria, Minnesota & California, Alabama, New York, and Rhode Island. They are excited to develop summer projects and they will post their proposals here next week. Our team includes four college students, four who just graduated college, two high school teachers, and one high school student. And there are the old-timers. To get ready for field work, we took the Hjelm House out of winter storage and cleaned out our storage facilities (g3). We inventoried supplies and made signs and tags for fieldwork. Everyone got a pouch with tools and supplies and Gretel has assigned us all a data collector. This may be (should be) the last year for our trusty handspring visor data collectors. The visors are trustworthy, but the computers and software that run them are showing their age. 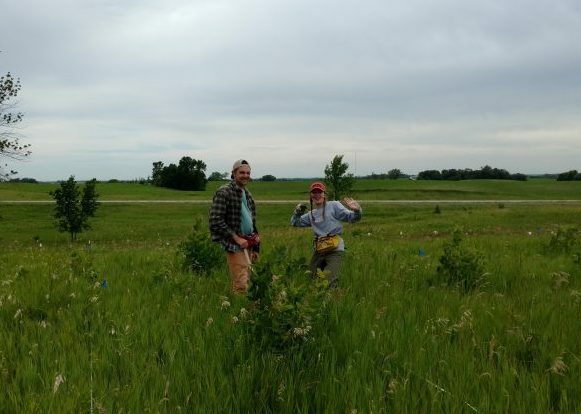 The first main activity of the season was assessing survival and growth of 2526 plants in the Q2 experiment, which is designed to quantify the additive genetic variation in two Echinacea populations. The amount of additive genetic variation determines a population’s capacity for adaptation by natural selection. 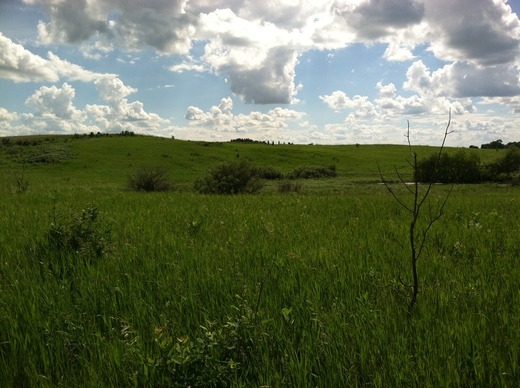 Genetic variation is very important for the persistence of populations in prairie habitat. We’ll find out how much variation Echinacea has, which will give us some ideas about future prospects for these populations in the rough-and-tumble and rapidly changing world out here. We got rained out several times this week, but managed to measure all 2526 plants. 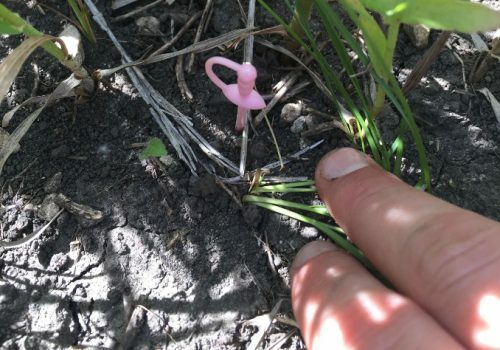 We found a few plants that escaped detection last summer and we even found one seedling. Welcome to the experiment, fellas! We’ve got our eyes on you. Overwinter survival appears to be quite good and most of the toothpicks we used to identify individual plants made it through the winter too. The tallest plants were just over 20 cm and some plants had 3 or more leaves. This is great news for plants that were sown as seed in fall 2013. Growth conditions are challenging: a cold winter with little snow, a dry spring, shading out by established plants, chewing by herbivores, … it’s a tough life for a prairie plant. All in all, it promises to be a great summer. We’ll keep you posted. CG1 – 1 gallon (24 Sept) + 1 gallon (30 Sept) + 2.5 gallons (2 Oct). We then headed to Hegg Lake to scout out a planting site for the sprouts. We settled on a spot near the parking area, to the west of Amy’s, Caroline’s, and the recruitment plots. 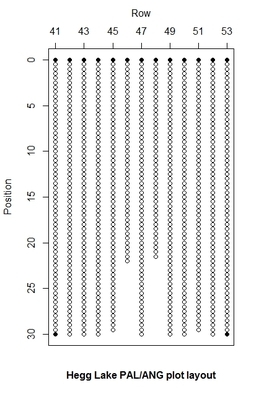 The plot is 12m x 30 m with 13 rows and 60 positions. There is a meter spacing between rows and half a meter between positions. Empty circles indicate positions where a sprout was planted and black dots indicate positions where there are nails. Plants begin at position 0.5 in every row. Row 41 is the most western row, and position 0 is closest to the road (and north). There are empty positions at the ends of rows 46 and 48. There is a bent over flag at each of the 4 corners of the plot. I’m excited to have the sprouts in the ground and to have participated in my first planting. Fingers crossed we have high survival!